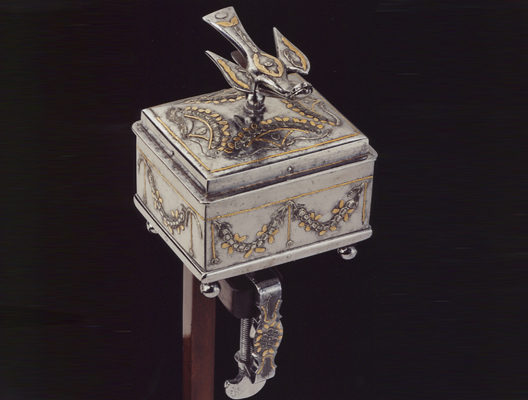 A most unusual and complete Russian sewing box made at Tula out of polished steel inlaid with floral swags and drapery. The top surmounted with a bird that is operated with a spring mechanism to hold the thread. The underside still retains the original screw device for fixing on a table top. This type of object was made at the Imperial Arms Factory at Tula and would have been given to visiting diplomats or the aristocracy. Another box without the fixing is illustrated in the catalogue published by J. Kugel in 1998, “Tresors des Tzars”, catalogue number 194, page 76. The mahogany stand is modern. 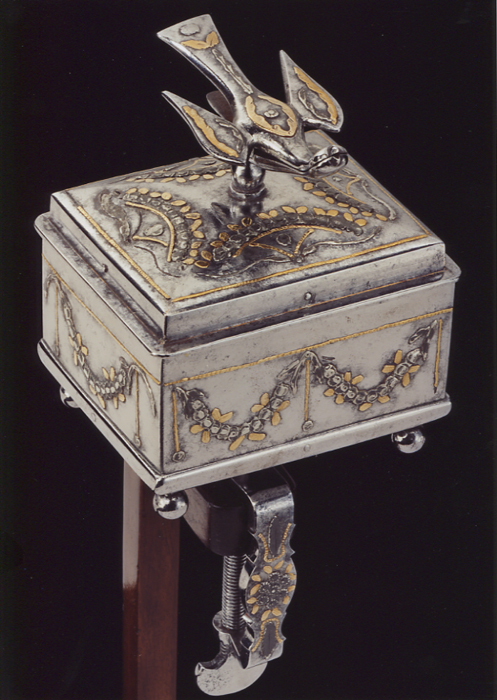 Height of box with holder: 7 3/4in (19.7cm). Width of box: 3 1/4in (8.5cm). Depth of box: 2 3/4in (7cm).